Cosmic Gate know that all good things come in threes… Musketeers, Wise Men, Stooges? All threes… Dimensions? Always cooler with that thirdone! “3” as the saying goes “is the magic number”! After ‘Falling Back’ & ‘Run Away’, Nic, Bossi & Eric Lumiere this month invoke their own rule-of-three, returning with ‘Edge Of Life’ – their (yep!) third single. Back in the spring, ‘am2pm’ scored Tune Of The Week & Future Favourite on ASOT, raced to over 1 million Spotify streams and shot to the #1slot on Beatport’s trance chart. There it lodged for two straight weeks, receiving substantial DJ & radio support from Armin van Buuren, Above & Beyond, Paul van Dyk, Markus Schulz, Ferry Corsten and others throughout. Now for summer, the lads are set to field their first vocal number of the year… Premiered, by Armin on ASOT771 and already supported by Ferry Corsten, it’s also been praised by DJ Mag (in their 8.5/10 scoring review) as Eric’s “finest vocal to date”. For it the Californian’s dug deep and through verse & chorus, brings a cryptic reflective to ‘Edge Of Life’s theme, while Cosmic Gate’s production supplies its uplift. Shedding light on their new single, Nic Chagall says: “a couple of months back, Eric, Bossi and I were talking about how so many people that we admired, had been lost to the world this year. Bossi pointed out that those guys had also done a lot with their lives and really made their time count. I think that struck a major chord with us all”. 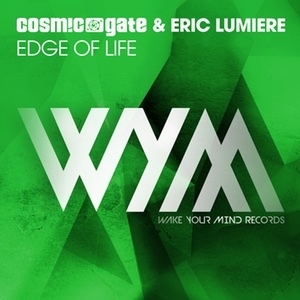 Cosmic Gate & Eric Lumiere’s ‘Edge Of Life’ is available through iTunes, Beatport and Spotify from today.